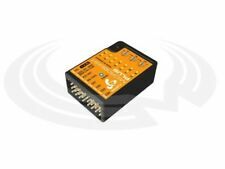 Kiss FC 32bit Flight Controller (Keep It Super Simple) PRODUCT DETAILS The KISS Flight Controller is a 32bit multirotor controller by Felix Niessen, Flyduino This F3, 32bit flight controller and accompanying firmware were designed and built with simplicity in mind. Both creations strive to be as minimalist as possible, thus providing the user with one of the quickest configurations/setups prior to getting their multi-rotor airborne. The flight controller’s firmware is custom made by Felix Niessen,titled “KISS FW”. The KISS Firmware features Felix’s custom “KISS PID Controller” and a fixed loop-time of 980Hz. Specifications Supported multi-rotor types: Tri Quad /x Hexa /x Supported RX types PPM Sum Spektrum Sat. The Omnibus F4 has the F4 processor, built-in OSD, video filtering, and LDO. Tuning could not be easier with the help of the black box and tuning via transmitter in the OSD. 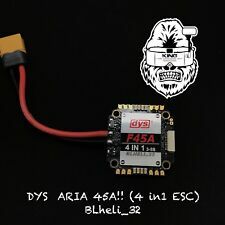 Along with the MPU6000 are a and an AB7456 OSD chip (an upgraded MAX7456) for the BetaFlight integrated OSD. It should provide near identical functionality to Spektrum AVC. New jumpoff from DYS !! ---3-5s Lipo --- ---BEC: 5V/3A 9V/1.5A --- ---Support Dshot 1200/600/300150, oneshot, Multishot. Specification: - Main Controller: 32-bit MCU - Sensor: High-precision 3-axis gyroscope and 3-axis accelerometer - Gyroscope Scale Range: ±2000 dps - Accelerometer Scale Range: ±4g - PWM Output: 920uS ~ 2120uS with 1520uS center length / 50 ~ 333Hz - Input Voltage: 4.8V ~ 8. Yeah Racing 2 in 1 Aluminium Camber Gauge & Parts Tray! Various colours! Used CSM SL520 Gyro, taken from my Align 600 as ive now gone flybarless. These are great gyros, easy to setup, with great UK aftersales support direct from CSM. AR7200BX Beast X system. I have no clue on these or how they operate, they look pretty complicated bits of kit and I do not have a heli it will fit in. The super smooth soft start, along with its ultra high resolution throttle response puts this ESC in a class of its own. Max RPM:240,000rpm for 2 Poles Brushless Motor. Max Cont Current:30A. PWM:8~16 KHz. Guardian 2D/3D Inertial Stabilizer. In 2D flight mode , the Guardian provides much smoother flight and wing leveling stabilization for your model, which makes it a lot easier to adjust and fly your plane. 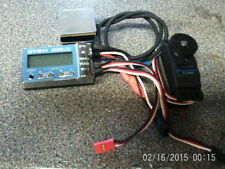 Output for 4 motors on JST-SH 1.0 8-pin plug connects to Airbot Wave 4in1 ESC via 8-pin 4in1 cable (not included). 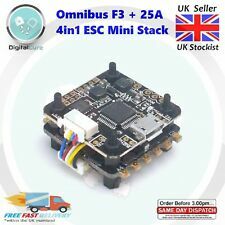 1x Airbot Omnibus F4 Nano V6 - Pre-flashed with BetaFlight v3.5.2 or later. The board also features an MPU6000 gyro connected over SPI for fast, accurate, low noise gyro data and can support 2-6s direct input. ↵ Kiss FC 32bit V2 Flight Controller (Keep It Super Simple) PRODUCT DETAILS ARM-Cortex M7 MCU with FPU @ 216Mhz for even the most complex algorithms. up to 12 times faster now. Powered directly by the battery (2-6S) max. 500mA @ 5V avoids unnecessary weight. Onboard USB CP2102 USB-UART USB controller for easy updates of FC and ESC directly via GUI. Bidirectional communication ultrafast Dshot 2400, sinHybrid and full Kiss Telemetry support. Serial Monster. You can adjust gain from the transmitter CH3 by using the remote gain function. High Precision Gyro GC301 (1 pc). Gyro Sensor: Vibration Structure Gyro. The Gyro's heading hold effect manages steering output by automatically keeping the car's tires aligned in the direction you chose. 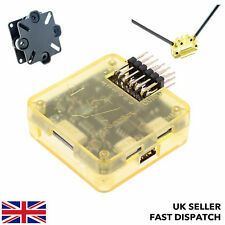 ↵ Foxeer F405 AIO F4 Flight Controller with Betaflight OSD for FPV Drone Freestyle Quadcopter Specifications: Size: 45*45mm Mount hole:30.5*30.5mm diameter 4mm Weight:10g Input:3~6S Maximun current:4*50A PCB :6layer 2.5OZ BEC:5V/2A 9V/1.5A Processor: STM32F405RGT6 GYRO:MPU6000 Flash:16MB Fireware:Betaflight Foxeer F405 OSD:MAX7456E Features: Solder&play camera remote control No need capacitance&resistance, directly connect CC(from F405) to OSD pin(Cam) to realize it Available for Foxeer Predator V2/Monster Pro/Arrow Pro PDB built in, the maximum current is 4*50A Betaflight OSD MAX7456E,support 5*UART Package included: 1pc x Foxeer F405 AIO F4 Flight Controller. The F405-Wing has a dedicated iNav firmware target (MATEKF405SE) making it easy to update directly from the iNav software GUI. OSD : INAV OSD w/ AT7456E chip. 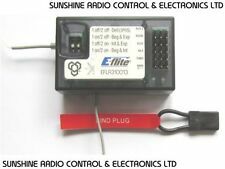 12V option with Jumper pad. Output Ripple : 50mV (VIn=24V, VOut=5V@5A load). With instructions. If possible I will ask my wife to send the item out out but if this is not possible there may be a delay due to my absence from the UK. Here for sale aFutaba AVCS GY611 & BLS251 Gyro Servo Set. Weighs just 6.9 g - a full 9 g less than any other heli heading hold gyro! 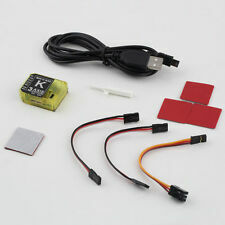 250~450 size electric: Futaba S9257 EP Heli Digital (280Hz/1520us).31~.91 size helicopter: Futaba S9254 Digital Heli servo (280Hz/1520us).